This synthetic hair bun is the easiest way to make the perfect bun. Simply use the bun's clips and toggle to secure to hair. 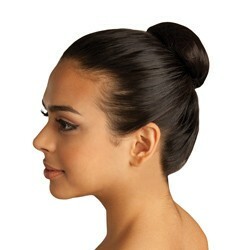 Made of a Nylon/Polyester blend, the Allegro Bun is a pre-shaped bun wrapped in a hair net. Gather hair to desired location on head and secure. Place bun over the top, tighten using clips and toggle. Tuck toggle under. Use hair and/or bobby pins to secure. 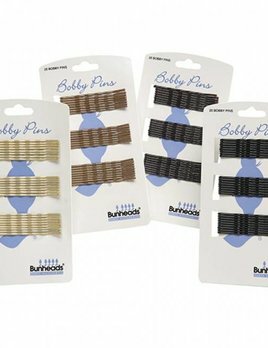 Double coated black bobby pins are perfect for bun making and come 25 to a card.